While most of us can look forward to over-indulging during the Christmas period, Digital Union member, Communicator, will be taking on a 3,000 mile cross-Atlantic rowing challenge. It is looking for local businesses to help showcase the best innovation from North East. Guy Clack software product manager at email software provider Communicator, and his team mates Dave Higgins, a mechanical engineer, Claire Hughes, a professional project manager, and Phil Kite, former Reece Group chief executive are taking on the cross-Atlantic challenge in a bid to raise money for deserving North East charities. The quartet, known as Team Tyne Innovation, are members of Tyne Amateur Rowing Club, in Newburn, Newcastle. The challenge, which starts on 12th December 2018 is expected to take around 45 days – meaning the team will be rowing over the Christmas and New Year period. North East innovation is a key part of the team’s bid. In completing this extraordinary challenge their ambition is to demonstrate the innovative spirit that is alive and kicking in the North East. The boat will become a living exhibit in the months leading up to and during the race. 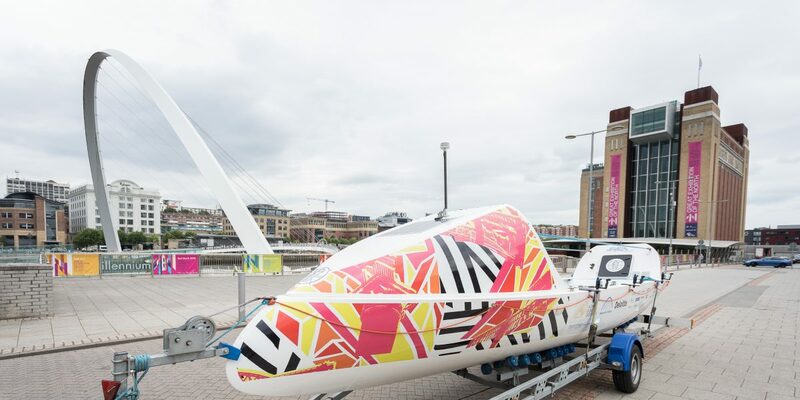 The team are looking for partners to help them in their quest to use the boat to market the best innovation from North East and showcase them to the world. Team Tyne Innovation are looking to incorporate innovative products, services and ideas that will improve the design and function of the boat, improve the crew’s physical performance, offer protection from the elements, improve communication or maintain the health of the crew. The team have a £100,000 fundraising target for some incredibly deserving charities that are close to their hearts – Daft as a Brush Cancer Patient Care and the Stroke Association. Team Tyne Innovation will be among 35 teams from across the world competing in the race. They are hoping the North East will get behind them. Several businesses, including lead sponsor Communicator, have already backed the team. They are offering a range of additional sponsorship opportunities including Gold, Silver and Bronze for businesses, and Just Donate for individuals. There is also an opportunity to become an Innovation Partner and even vote to name their boat! For more information and sponsorship, click here. In completing this extraordinary challenge their ambition is to demonstrate the innovative spirit that is alive and kicking in the North East. The boat will become a living exhibit in the months leading up to and during the race.